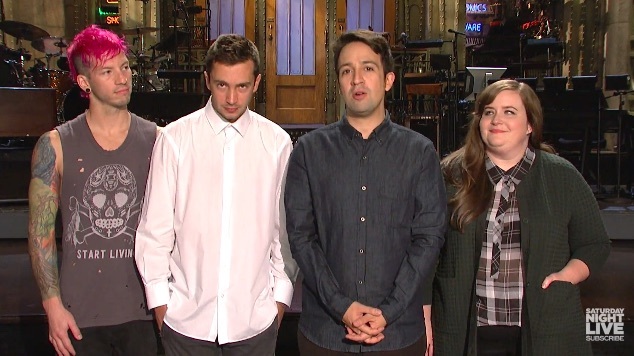 There are MORE Lin-Manuel Miranda SNL promos to be had everyone! Due to the fact that we’re somewhat obsessed with all things Hamilton, Lin-Manuel Miranda is one of our favorite humans (even though we’re still getting used to him without his signature long hair!). As you probably know he’s hosting Saturday Night Live tomorrow with musical guest Twenty-One Pilots, and there have been some great promos so far. But if you’re aching for another, YOU’RE IN LUCK!!! Vulture let us know about the latest one, and it features the hilarious Aidy Bryant freestyling about Hamilton, telling some (terrible) jokes, and introducing herself in song. You really have to see it. SNL kicked off to a great start with Margot Robbie hosting the 42nd season premiere last week, proving yet again that SNL is still going strong. And we seriously CAN’T WAIT for this week’s episode (judging from the promos, Miranda is gonna kill it as host). The guy is multi-talented to boot, and let’s face it — what other person on the planet can rap about Harry Potter one moment, and win a Pulitzer Prize for Drama the next?! SWOON.